Bushnell Legend Ultra HD Binocular - How Usable Is It? The Bushnell Legend Ultra HD — Lovable or Not? 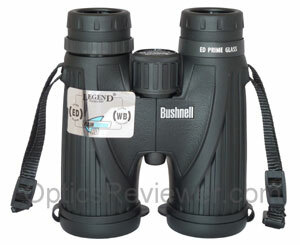 The Bushnell Legend Ultra HD binocular has become very popular. In response to requests for a review of it and because we, too, were curious to learn about it firsthand, we ordered one. We found the optical "sweet spot" to be a bit smaller than average, but inside that sweet spot it provides great details at a reasonable price! On one of our initial excursions with it, if not the very first, we happened to find an indicator of spring approaching the region where we were. It was a chilly day and we noticed her perched on a branch of a fallen tree, adjusting and re-adjusting her feathers. She looked to be smoothing feathers on her chest at first. She would pause to look around shyly. Then she was moving on to straightening wing feathers. She would stretch out that aristocratic neck and re-arrange the feathers at the base of her throat before remembering to check her side plumage again. She steadily preened as though, we were tempted to think, expecting a boyfriend to come by for some socializing. It was wonderful to watch this heron which brought promise of warmer, springtime weather. It seemed as though we must have watched for perhaps twenty or thirty minutes. For that brief interlude, we joined her secluded world. As she turned to face the other way, somewhat inelegantly losing balance with those long, long legs, she spread her wings for a brief moment to help maintain her position on the branch. Then, as quickly as it had started, the private interlude ended. She straightened that long neck and fastened her attention on the water below for a brief moment. Then she was gliding down to land along the end of the water. After a brief stalk, she plunged her head into the water for a morsel of food. That was it. She was off and away for a bit of lunch. We had been captivated not only by her beauty, but also by the close-up presence experienced through the Bushnell Legend Ultra HD binocular (10X42) we were using. Thanks to the extra-low dispersion (ED) glass, the resolution of details made it seem as though we were close enough to have reached out and touched her. Why is the new Legend Ultra HD binocular so popular? That's what we're interested in, right? 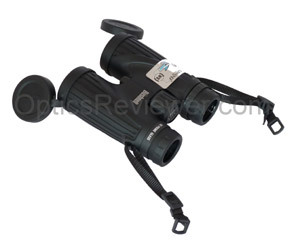 This review is focused on the Legend Ultra HD binoculars of the roof prism design. We'll provide some helpful information about the reverse Porro prism compact Legend Ultra binoculars, but this review doesn't focus on them. The Bushnell Legend Ultra HD binoculars are not as tall as some, either. The 10X42 model we bought for testing stood 5.75 in/146mm with the twist-up eyecups fully extended. While the advertising we've seen hasn't mentioned it, we found it to have the same "soft-touch thumb grip" as other models have. We wondered what it was and thought you probably would, too. When we asked a Bushnell spokesman about it, we found out that a gel pad is placed under the rubber armor. Since people's grip and size of hands vary, the gel pads cover a somewhat larger area than a single thumb indent might. This is intended to provide for a comfortable grip in a variety of circumstances. Since the armor is sufficiently flexible, it was easy to feel the effect of this padding under our thumbs. Although we didn't perceive a significant difference when we were using them, you may find that they make it easier to maintain your grip without pinching nerves in your thumbs. At least that's our take on the concept. It's a different approach to thumb indents, which we'd previously considered to be primarily for the purpose of encouraging a grip that provides a good balance — thus lessening fatigue. Our testing didn't include cold weather, so we're not really in a position to comment on whether or not the gel freezes up. How will the gel pads last? If you've had a year or more of experience with a Legend HD, we'd be happy to pass along your experience with durability to others. A standard thread tripod adapter is at the front of the hinge. It's something we would expect for a full-sized binocular and, particularly with the ED glass, makes for much better use of the instrument. We recommend that Bushnell Legend Ultra HD binocular owners, as well as any other owner of a good quality, full-sized instrument, also purchase an optional tripod adapter and a tripod. The resolution achieved by the ED glass eliminating most chromatic aberration means that your limit on the resolution of details is now, more than ever, limited by your own slight movements with handheld binoculars. If circumstances allow it, using a tripod or an adapter that clamps to the edge of a car window will allow you to see much more detail than you might otherwise see. Why would you want to wash your precision optical instrument in the kitchen sink? Sometimes, accidents happen and a binocular is dropped into dirty or muddy marsh water. Sometimes the drop is directly into thick mud. If you lead a particularly interesting life, you may find that you have saliva on your objective lens from an inquisitive animal's tongue. Regardless of how it got there, there are times that removing a fouling layer from your instrument's lenses is best achieved by a careful bit of running water over the lenses before trying to touch them with even a soft brush. The Bushnell Legend Ultra HD binoculars are both waterproof and have been made internally fog-proof by replacing potentially moisture-laden air molecules with dry, nitrogen gas. Bushnell also has a "Rainguard HD" water-repellant coating on the exterior lens surfaces which they say is permanent. The nature of this coating is such that it will cause water / snow / sleet / condensation to bead up and provide a clearer view than would be otherwise possible. The sales literature also says that the Rainguard HD coating will prevent fogging if you breathe on the exterior lens surfaces. (We've had our share of problems with eyepieces fogging over when simply bringing them up to our eyes in cold weather!) That caught our attention so we stuck our Legend Ultra HD and another binocular in the refrigerator for 30 minutes to chill them. When we brought them out and breathed on the lenses, the Bushnell Legend Ultra HD's lenses still fogged over, but definitely cleared more quickly than the binocular without Rainguard HD coating. The eyecups are two-stage ones with a halfway detent and 3mm increments for each stage. They have a nice, positive feel and we had no worries about possibly pushing them back down from the intermediate stage by pressing them against our face as we have with some binoculars' eyecups. Eye relief for the Bushnell Legend Ultra HD binoculars is good. Of the four configurations available in the roof prism model, our 10X42 had the least eye relief at 15.2mm and the 8X42 had the most at 17.2mm. Some have found that the eyecups don't extend far enough to provide comfortable viewing for people who don't wear eyeglasses, although most seem to do alright with them. We found the center focus wheel to turn smoothly and evenly counter-clockwise from close focus to infinity. Our regular readers know that we prefer a fast focus, one that goes from close focus to infinity in about one full revolution of the focus wheel. A fast focus makes it much easier to track a swiftly moving object or spend long hours in the field checking views both far and near. The Bushnell Legend Ultra HD binocular takes about 1.5 revolutions to go from close focus to infinity and we're willing to take that as being on the outer limits of acceptability. Whenever we used our Bushnell Legend Ultra HD 10X42, we noticed a "rattling" noise. That made us nervous because we thought it sounded suspiciously like loose glass inside the instrument. We were prepared to contact the fine customer service folks in Overland, Kansas, and quickly! You might imagine our relief when we found that it wasn't loose glass rattling inside the binocular at all. If you look at the photo, you'll see some space between the focus wheel assembly and the frame. A spacer, or disk, sliding back and forth in this area is what causes the "rattling" noise. We found through discussions that this seems to be common with the Bushnell Legend Ultra HD and should not be a cause for concern. What's the easy fix for it? If the noise bothers you like it does us, just slip a bit of rubber snipped from an O-ring (this lasts longer) or rubber band between the moving part and one side or the other of the hinge. It will be an effective silencer until it falls out — usually a decent length of time. The Bushnell Legend Ultra HD we tested was stamped with the model number and "China." We're guessing that this means the instrument was manufactured in a Chinese optical manufacturing plant. While the country of manufacture is significant to some, we've found that it's not necessarily a predictor of an instrument's overall quality. The company advertises that the Bushnell Legend Ultra HD binoculars have 340ft / 113m field of view at 1,000 yd/m. We calculate this to be about a 6.46° angular field of view. It's not a bad field of view as long as it's useable. Our interest lies in finding out how much of the field of view is useable. To say it differently, how big is the optical sweet spot in the middle of the field of view that is in sharp focus before the curvature of the lenses causes the view to go out of focus to the point that it's no longer usable. What we found, when we tested the Bushnell Legend Ultra HD binoculars, was that the sweet spot was sweet indeed. The resolution of details, contrast, and control of chromatic aberration was excellent within the sweet spot. We were impressed with the performance within the sweet spot. However, we felt that the sweet spot was a bit small. What causes this kind of performance within the sweet spot's area? The fact that the binocular glass is fully multi-coated is certainly part of it. The fact that it uses extra-low dispersion (ED) glass made with fluorite reduces chromatic aberration inside the sweet spot and enhances binocular's ability to resolve detail. The BaK-4 glass used in making the prisms is certainly a part of it, as well as the prism's reflective coating of silver alloy. (We wondered what kind of reflective prism coating was used and thought you might, too. Since the information wasn't published, we asked the company and learned it's a silver alloy reflective coating.) What Bushnell chooses to call "ultra wide band coating" is likely a part of the Legend Ultra HD's performance as an anti-reflective coating which is said to provide for enhanced light transmission across the light spectrum. At about 50&percnt; of the field of view radius with the instrument we used for this review, we noticed that the viewed image began losing some of its resolution of detail. That is to say, some of the details started losing their distinctness. At about 25&percnt; of the radius in from the field of view's edge, the view began to get fuzzy or blurred and unusable. Discussions indicate that others have had the same or quite similar experience with Bushnell Legend Ultra HD binoculars as we did. What does this mean? If you're using the Bushnell Legend Ultra HD binoculars as handheld optics, you're likely to automatically and intuitively point them at what you want to see. In this type of instance, the small sweet spot isn't likely to bother you since you'll tend to center the sweet spot on what you want to see. Unfortunately, while using binoculars as handheld instruments, you're not likely to experience the full benefit of an optic which has above average ability to resolve details due to your breathing and such causing your hands to move ever-so-slightly. The bottom line is that the usable field of view for the Bushnell Legend Ultra HD binoculars may be smaller than the usable field of view for a binocular for which the manufacturer / seller gives a narrower stated field of view. Whether or not this optical situation is acceptable or not depends entirely on you and your priorities. Other than the 10X25 pocket model of the Bushnell Legend Ultra HD binoculars, the exit pupil seems reasonable with a range from 3.60-5.30mm and should serve the needs of most adults. The larger exit pupils will be more useful in low light conditions. The smaller exit pupils of the pocket binocular are an optical tradeoff to achieve the small size for those who prioritize a pocket size optic. The colors viewed with the Bushnell Legend Ultra HD binoculars tended to be true, with a possible, but very slight, bias toward yellows. We noticed chromatic aberration outside of the sweet spot that appeared significant, although nearly all chromatic aberration was controlled inside the sweet spot. We found that the Bushnell Legend Ultra HD binoculars had an above average performance in dealing with strong light. Sunrise and sunset as well as sunlight reflected off water seemed to be less problematic with the Legend than with other binoculars in the same price category. What we do in testing a binocular's ability to control strong or stray light is to do our best to induce glare by coming close to viewing a sunrise/sunset (no, we don't look at the sun, yes, we come closer than perhaps we should!) or by seeing how the instrument deals with sunlight reflected by water/ice/snow/etc. If you anticipate that much of your optics use will be around or near reflective surfaces under sunny conditions, we highly recommend the Bushnell Legend Ultra HD binocular as above average in its price category. We took the Bushnell Legend Ultra HD out in the evening to see what it would be like in low-light conditions. We purposefully sought out a particularly bright light in a car parking area to see how it would perform when we looked at the light straight-on. We had a hunch, as we discussed it earlier in the day, that the Legend Ultra HD be as good controlling spiking off the bright lights at night as it was in controlling strong light during the day. We were not disappointed. Just as the Legend Ultra HD was above average in controlling strong daytime light, we found it to be above average in controlling spikes from strong lights at night. We did notice, however, that it had a couple of "floating spots" of light when we would pan back and forth and view the bright light across the entire field of view. They could be disconcerting if using the instrument for long periods under such conditions, but we felt it was less troublesome than having strong spikes of light emanating outward from the light source would have been with another binocular. If you're going to be using your binocular for viewing stadium sports, the Legend's control of strong light is a positive. It's especially so if you're likely to use them at evening/night games! For light transmission (brightness), we found the Legend Ultra HD to also be above average. We were delighted to be able to watch a family of mallard ducks — the parents and three energetic ducklings — in the growing darkness before we headed back indoors. When we looked at the moon, the details afforded by the extra-low dispersion glass smoothing away the chromatic aberration were wonderful. The surface looked as rough, rugged and pocked with craters as you might imagine. The specifications in the literature for the 10X42 Legend Ultra HD say that its close focus distance is 6.5ft/1.9m. We measured the close focus distance at 6.0ft/1.8m. It's certainly within the 8.0ft/2.4m close focus distance we recommend for bird watchers. Our regular readers will know we strongly favor a locking diopter adjustment since it's so easy to accidently change a non-locking one — with the resulting headaches and/or eyestrain until it's discovered and corrected. 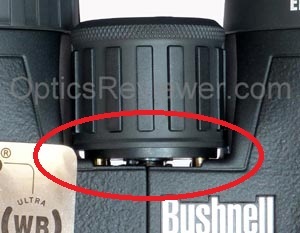 The diopter adjustment on the Bushnell Legend Ultra HD binocular is a ring under the right eyecup. With the twist-up eyecup extended, it's an easy matter to gently pull the ring up toward the eyecup. When you hear or feel a "click," you'll be able to rotate the ring to achieve the proper adjustment for your right eye. When you're satisfied with the setting, simply press the ring back down and it locks the adjustment until you're ready to change it. What Do I Get Along With It? 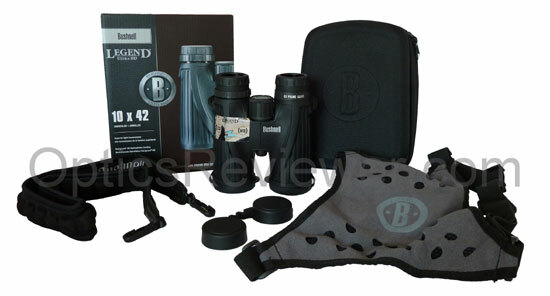 Included with our 10X42 Bushnell Legend Ultra HD we received a binocular harness. If you've not used a binocular harness before, getting a $17 to $25 value (depending on where you buy it) included in the deal is a good way to get acquainted. Because the harness tends to keep the binocular's weight on your shoulders instead of your neck, many feel it's preferable to the traditional neck strap if you're going to be carrying and using your binocular several hours. We were interested in the construction of the harness and thought you probably would be, too. The straps that go around the shoulders are made of comfortable 1 in/2.5cm elastic straps. The panel that holds the harness centered on your back has a coarse, black synthetic net similar to the lining of a nylon windbreaker to provide for air circulation. A fine net, somewhat similar to mosquito netting, is between the coarse net and the panel surface you see in the pictures. The outside edges of the panel, where the three layers are stitched together, has the extra step of stitching a cloth tape along the edge to avoid fraying, which is a nice, quality touch. There are two adjustable straps that attach to the binocular's lugs and have D-rings where either the traditional neck strap or the binocular harness to clip. This arrangement makes switching between the neck strap and shoulder harness both quick and easy. The case is a hard-sided, molded case with zippers around three sides and a fabric hinge on the bottom. There are two zipper pulls so you're not stuck having to maneuver one zipper pull around all three sides. 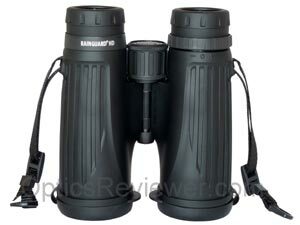 The size you put the binocular on has a protrusion that fits between the binocular's barrels to hold it steady. The other side has a net coming about halfway up that makes a very generously sized "pocket" to hold lens covers, gloves, etc. Certainly, the binocular harness would easily fit in the storage area of the case. 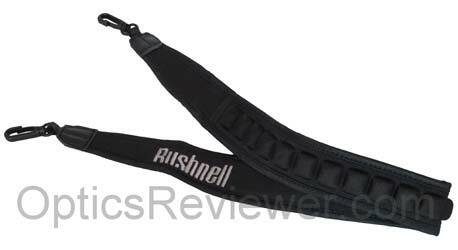 The neck strap included with the Bushnell Legend Ultra HD is a nice wide one — but this one goes a bit further than simply nice and wide. Interestingly, it has a series of nylon-covered cushioning bumps that vary the load on the neck strap. Although the bulk of our testing didn't take place during the main hot and humid part of the summer, we conceive that the main benefit to be realized is that the cushions would likely act to raise the strap off a person's perspiring and uncomfortable neck. If it achieves that goal as well as we think it likely would, it would be welcomed by anyone who has spent a humid afternoon with a sticky neck strap. A carry-strap for the case is included, as is a lint-free bag with a drawstring for the binocular, and a microfiber lens cleaning cloth. The rain guard for the Bushnell Legend Ultra HD's eyepieces is made of a softer rubber which stays where you put it by friction. It's not so soft that we had concerns about it tearing under normal use and it's flexible enough that we felt comfortable that it wasn't going to pop off the eyepieces. The covers for the objective lenses seemed to be made of about the same material as the rain guard. While that material was very good for the rain guard, it seemed a little weak to use for lens covers to the point that we were nervous about losing them. Instead of taking the risk of losing them, we immediately took the objective lens covers off and stored them in the carrying case's pocket. Since the Bushnell Legend Ultra HD comes in at quite a reasonable price and it's hard to come up with serious negatives to outweigh the pricing. No, they're not perfect, but they're a very good value for the money. We're quite comfortable recommending the Bushnell Legend Ultra HD as a solid value for the money for a wide variety of binocular users from bird watchers to hunters and from sports fans to farmers/ranchers. We buy a lot of stuff at Amazon and typically find they have the lowest prices for nearly everything as well as excellent customer service. Feel free to use this direct link to the Legend Ultra HD selections at Amazon.com . We like the way the Hamiltons run Eagle Optics and the way they put the customer first. For our friends living in the UK and South Africa, we provide this direct link to the Legend Ultra HD selection at Amazon.co.uk . We included the Bushnell Legend Ultra HD in a comparison with other binoculars in the same price range. Those wanting to get the best optics for their money will want to see our Bushnell Legend Ultra HD comparison article. If you're interested in the Legend Ultra HD Compact, we've put that just a little further down on this page! The Bushnell Legend Ultra HD binocular is covered by Bushnell's "Bulletproof Guarantee." For purchases in the United States and Canada, Bushnell will refund the purchase price if you bought the binocular during 2012 and you're not satisfied with it — up to a year after you bought the binocular. The regular Bushnell limited lifetime warranty applies to the Legend Ultra HD, too. It warrants that the binocular will be free of defects in materials and workmanship for the life of the instrument or it will be repaired for a token amount to cover shipping and handling. It's a good warranty. 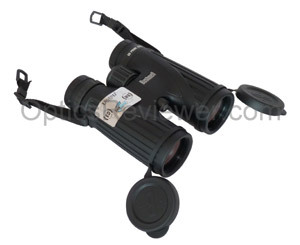 The 10X25 binocular is a pocket binocular by most definitions and it includes ED lenses, but does not adapt to a tripod. We couldn't find that the interpupillary distance measurements were published anywhere. We wondered what the distances were and thought you might, too, so we asked a person at Bushnell who very kindly and graciously found the values and provided them. The Compact version of the Legend Ultra HD is a reverse Porro prism model with a chassis made of tough, lightweight polycarbonate. (Friends and others had speculated that they were made on a magnesium chassis, just like the larger, roof prism design Legend Ultra HD. We wanted to know for sure whether just what the chassis was and thought you would, too, so we asked our friend at Bushnell.) Due to the nature of the design, when we asked our Bushnell friend about it he confirmed that the company doesn't feel that ED lenses would make enough of a difference in the image viewed to merit putting them into the compact model. Other than that, you're getting most of what goes into the Bushnell Legend Ultra HD binoculars which are made with the roof prism design as reviewed above. That includes prisms made of BaK-4 glass and fully multi-coated optics. It also includes waterproofing, fog-proofing, and having the air purged with nitrogen — which isn't always done for reverse Porro prism binoculars. Since Porro prisms don't need reflective coatings, these don't have the silver alloy coating that the roof prism design uses. These compact binoculars also have twist-up eyecups instead of the fold-down rubber eyecups typical on compact binoculars. Finally, the exterior lens surfaces are coated with Bushnell's RainGuard to help keep moisture from bothering your view. As with the interpupillary distance values given in the table above, those in the following table are courtesy of the Bushnell spokesman who looked them up and provided them to us.